Rhys Bowen is the pen name for the British woman who has written The Tuscan Child, and she appears to be a writing machine, having churned out 40 mysteries, including the Constable Evan Evans series, the Molly Murphy series, the Royal Spyness series, the Red Dragon Academy series, and the Boyfriend Club series for young adults. In addition, she’s written two volumes of short stories for the Molly Murphy series and the Royal Spyness series. Under her own name, Janet Quin-Harkin, she launched the Sweet Dreams series, plus wrote 11 more novels, including Wanted – Date for Saturday Night, The Boy Next Door, Who Do You Love?, and Love Potion. Perhaps the frothy titles led to the pseudonym, which has rocketed her into stupefying levels of productivity much like her counterpart, Barbara Cartland, who published 723 romance novels by the time she died at the age of 99. Bowen is only 77, so maybe her female fan base can look forward to yet another series springing from the heroine of The Tuscan Child, who sets out to solve a mystery à la Nancy Drew. Unfortunately, Bowen’s heroine does not have the style and panache of Carolyn Keene’s: no roadster, no loving lawyer father, and no devoted boyfriend named Ned. Instead, Joanna Langley is the poor child of an unloving father, and the girlfriend of a swinish boyfriend with whom she’s been living until he dumps her for someone who better enhances his career. This break-up comes on the heels of a car accident that causes Joanna to miscarry a pregnancy that she has embraced but the swine has insisted she terminate. Tossed out of his London apartment, she moves her battered self, her broken heart, and her few belongings in with a girlfriend and sleeps on a cot. A short time later, her father dies and, as her mother is also dead, Joanna is now an orphan — or so she thinks. Joanna knew her father, a former RAF pilot, had been shot down over Italy toward the end of WWII, but she knew nothing else because he never shared that part of his life, or much more, with her. 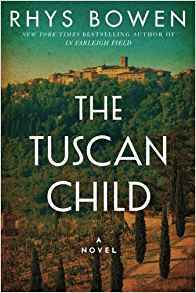 So she decides to head for Tuscany to solve the mystery of the hidden child and to see if she might have a sibling, which she hopes might give her a semblance of family and bring her closer to her aloof father. We follow her into the lavender hills of central Italy to the fictional village of San Salvatore, where we delight in her discovery of food — real food with fresh ingredients. Accustomed to boiled meat, blanched vegetables, and plastic carryout, she stays with an Italian woman, who introduces her to the glories of sun-kissed tomatoes, warm olives picked ripe off the tree, oven-baked biscotti, and sweet wine pressed from garden grapes. In these scenes, stolid prose starts dancing as Joanna savors the abbondanza of a Tuscan kitchen. As we know, Bowen is no rookie; she’s mastered the rules of her genre. First: Hook them from the get-go. So she opens with: “He was going to die, that was quite obvious.” Second: Tease with cliffhangers. Most of hers are formulaic (“He had no idea how dramatically things would change by morning”). But midway through, when Joanna can’t get water from her shower, Bowen sends her to — the well. What does she find? (Bowen asks a lot of questions to push her plot forward). “A man’s body jammed head-first into the well.” Move over, Nancy Drew. Joanna now has a murder to solve, as well as the mystery of the child. Third: Give them a fairytale romance, which Bowen dutifully delivers when Joanna meets Renzo, who — surprise, surprise — is single, impossibly handsome, immensely wealthy, and who wants to be a chef. What could be more delicious for a young British woman who didn’t know the difference between paste and pasta? The airman has been saved from starvation by the food Sofia sneaks to him on midnight visits unseen by the villagers. He shows Sofia his amazing discovery, which they decide must be concealed from the Nazis. Religiosity pervades this book from the beginning. Sofia’s a devoutly Catholic woman who lights candles, goes to confession, and believes in a retinue of saints for every disease and dilemma: St. Blaise for sore throats; St. Rita for wounds; St. Clara for weather. Now, some Catholics who believe in the sacred seal of Confession might be more offended when the mystery is solved due to a priestly judgment (or misjudgment) on saving the village from the Nazis. They had discovered the crashed plane and knew the British pilot had escaped and was being hidden by someone in San Salvatore. What then transpires provides the twist needed to solve the mystery. The result: Sofia is last seen being carted off by the Germans; the pilot escapes to England and, never able to find Sofia, he marries his family’s charwoman, who gives birth to Joanna. She, in turn, becomes the protagonist of a book that can best be described as a Hail Mary pass.